The Wooden Spoon Charity and Cure Leukaemia were the clear winners when the Old Rose and Crown hotel in Lickey held a Music Extravaganza/Karaoke Night and raised £1,800 for the charities. 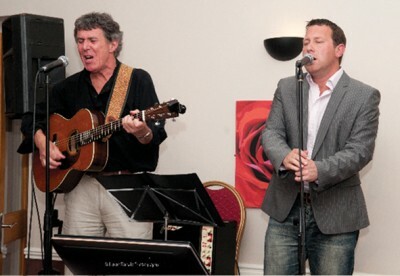 Hosted by locals Dougie and Amelia Brown as part of their London Marathon fundraising, the event saw guests treated to songs by Amelia, who is a classically trained professional singer, as well as former Bromsgrove School teacher Paul Greetham accompanied by Phil Kirwan on guitar (pictured above). Local schoolgirl Fran Kingston, whom Amelia had come across via her music career, was also invited to perform. After the professionals, the mic was opened up and an array of voices took to the stage, each having had money pledged to the charity if they sang – the only way to get out of it was to match that pledge with your own cash. Some were amazing – including the Old Rose and Crown’s very own Hayley – while others were so bad they were brilliant!